Only Judas is shown in profile, as only he had a hidden side of darkness, not open and loving as the other Apostles, who are shown with both eyes visible, a common iconographic form. We must remove through openness and love, any hidden malice or selfishness from our own hearts to join them in preparing for this Mystical event. 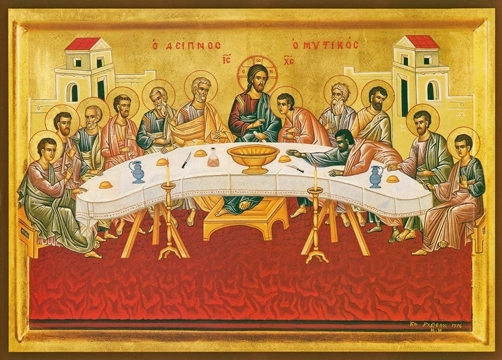 The table is rounded to show that there is always room for everyone to come and partake of Him.